Eventless Plot is a trio from Thessaloniki, Greece, who borrow elements from different genres and aesthetics to build their own hybrid of sound. From free improv and noise, to new electronica, electroacoustic composition and jazz, their music remains always unconventional and contemporary. They experiment with a variety of instruments, analogue sources, field recordings and Max/Msp patches. Active since 2002 in the experimental scene, they have participated in numerous festivals such as “Synch festival” (Athens, June 2008), and have shared the stage with artists like Giuseppe Ielasi, Angel, Vladislav Delay, Thanos Chrysakis, Chris Cundy, James O’ Sullivan and others. They have several releases in their archive including ikon (Granny records 2009) and Recon (Aural terrains 2012). Eventless Plot also work on designing sound and composing for art installations and film. In November 2008, at the request of Thessalonikiʼs International Film Festival, they composed a soundtrack for Victor Sjostrom's “Phantom Carriage” along with Granny records label mates Good Luck Mr. Gorsky. 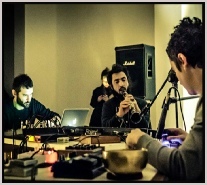 Currently e.plot's members travel between Thessaloniki and the Hague (Netherlands), extending their musical experience by researching electronic music and participating in many electroacoustic and free improvisation projects (including workshops with Richard Barrett, Peter Evans, Evan Parker, Sarah Nicolls among others), which have an obvious influence on the development of their new sound. Points of attraction is an electroacoustic composition created from improvised material that was recorded in Thessaloniki and the Hague in 2012. Several cue points define the structure of the piece, attract or repel specific sound structures or indicate changes in pitch ,rhythm and timbre. Blocks of multilayered material are created in this way, forming patterns that move in between chaos and absolute order, evolving or surprisingly collapsing.